For a while now I've been complaining about missing out on IRC conversations when I'm not connected to Pidgin. Finally, I set out to solve the problem. This post walks you through the solution I came up with. I decided to use an IRC bouncer to keep me connected and then relay the backlog to Pidgin when it connects. This, of course, implies that your bouncer needs to be running some place where it is always connected. I chose to use ZNC as the bouncer. I heard good things about it on the Internets. As you can tell by the name of my blog I like Linux, so, these installation instructions are for the Ubuntu distro both for the server and the client. We will start by installing ZNC and runit, which we will use later to run ZNC as a daemon, on the server. Now we are going to install a runit service which allows a non-root user to create runit services because ZNC strongly advices not to run ZNC as root, and for good reason. If this sounds confusing see runit user-specific services. If everything went OK you will get a message saying the service is running. Now we can install a runit service which runs ZNC as our user. Again, If everything went OK you will get a message saying the service is running. 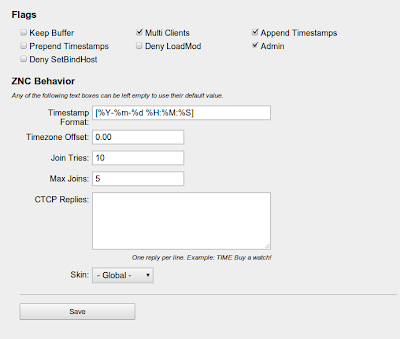 We are now done with the server setup unless you want to follow the process for removing duplicate timestamps described below. Again, fill in the fields accordingly. Port is the port where your ZNC server runs and Username is the same username you used for the previous step (freenode in my case.) 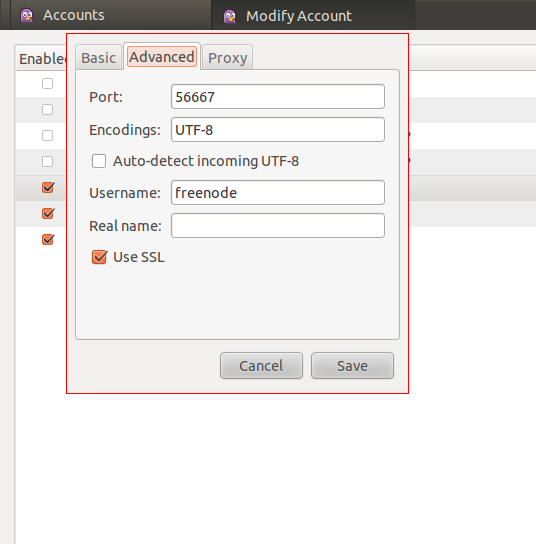 If you enabled SSL in your ZNC server check 'Use SSL.' Click Save. 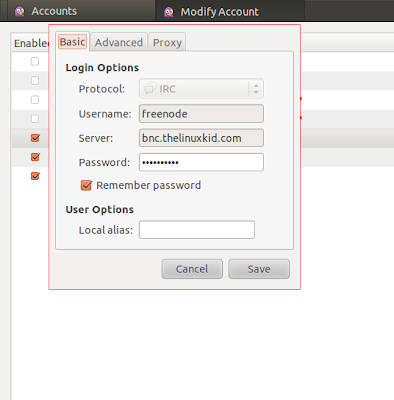 If everything worked you will now be connected to the the IRC server you chose in your ZNC configuration (irc.freenode.com in my case) and any chat rooms you setup for that server will open up automagically in Pidgin. Eventually, as you log on to Pidgin and see the replay of the backlog, you will see that the messages from ZNC come back with timestamps. This gets annoying since Pidgin also prints out timestamps and now you have two sets of timestamps for every line in the replay. Fortunately, there's a Pidgin plugin that fixes this problem. There are two steps for setting this up. The second step is to setup the Pidgin plugin on the client machine. Start by adding the plugin's PPA and installing the plugin. 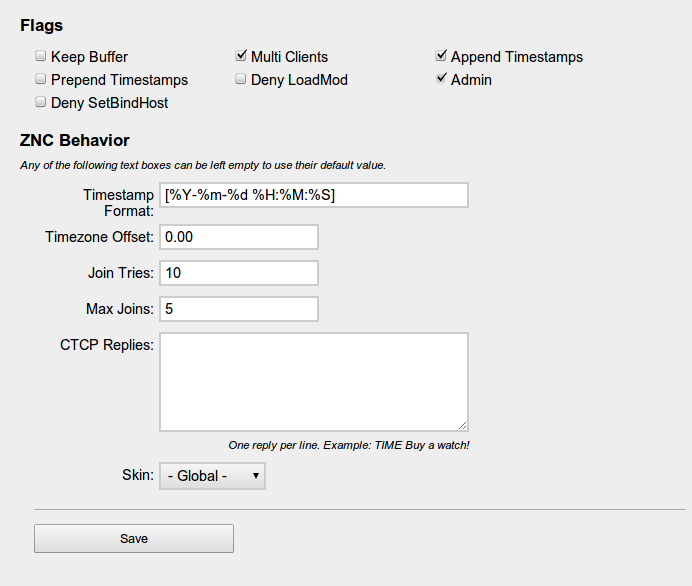 Check the box next to your ZNC user to activate the plugin for it and click Close twice. That's it. Feel free to comment, complain and tell me where I went wrong. very useful article. should your followers expect from you some info about secure virtual data room ? I think that you will do good with that.